"DRAW is not just a 'me-too' product. A valuable additional modality in our profession, in a league of its own." - Marvin J. Cain, D.V.M., Past President I.V.A.S., Consultant to 700 stables & farms, featured on the cover of Blood-Horse. Many animals do not respond properly to strong or synthetic chemical base modalities. The DRAW formulas are all natural mineral base liquids that can be administered through a localized soak, wrap, topical drop or spray. Over the years Vets, trainers and owners have called upon DRAW as their first choice application for returning topical wounds and injuries to their natural condition. "These formulations are strong and are my first choice for pain and injury for my family and my pets. For swelling, pain, rash, infection or even broken bones there is nothing else in the world that is more helpful than DRAW ® Products. Originally developed for animal injuries, don't let the animals on the bottles fool you. Animal or human, these products work." The DRAW ® family of products include soak, wrap, topical and spray applications. They can be used directly on the Basic Balance Points, muscles, tendons, ligaments and soft tissue. Now - Five Great Products! 1. DRAW ® X'traStrength ... 32 oz.- "It's Worth the Difference"
DRAW®X'traStrength uses the same mineral base formulation as DRAW®, except the suspended mineral particles have been ionically charged to match the electrochemical needs of the animal. The wide range of over 1,500 vibrational signals offers any blocked or imbalanced electrical pathway a viable support. DRAW ®X'traStrength has proven to be an excellent resource in opening blocked energy points and triggering the healing process. DRAW®X'traStrength is topically administered in the same manner as DRAW®. 2. Original DRAW ® ... 32 oz. The original DRAW ® product has been in use since 1986. It is a highly concentrated sulphated mineral formula used on animal athletes. It is fast acting and safe for deep cleansing of topical wounds and injuries. Used throughout the U.S. for quickly returning torn tissue to prior to injury status. 3. DRAWPlus Spray ... 8 oz.- "For the Most Immediate Needs"
Fast acting and quick penetrating Spray. Premixed with all the benefits of DRAW ® and DRAW ® X'tra Strength. Apply immediately in emergency cases and keep moist until DRAW ® or DRAW®X'tra Strength soak or wrap can be applied. External use on Joints, Muscles, Tendons and Ligaments. 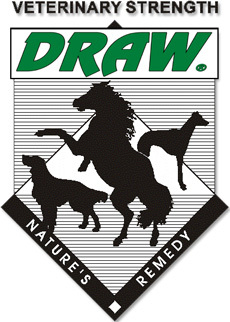 For decades, the DNR, Inc.’s DRAW ®family of products has enjoyed success as a modality preferred by many veterinarians and caregivers of animals. We are pleased to introduce the newest member of the family, DRAW ® Topical. DRAW ® Topical has been formulated with the same encoded signals as our other topical formulations, but with the added extra strength benefits found in DRAW ® . It can applied in the same manner as our other DNR, Inc. Topical Formulas for bringing balance to any energy pathway. 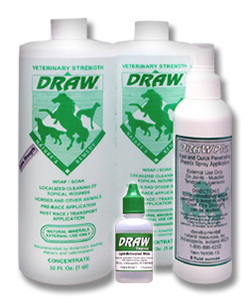 Users of DRAW ® Topical will find it a welcome and convenient addition to our line of animal care products. Click here for the entire article, "Acupuncture For Any Four Legged Animal"
5. QuickDRAW ® ... 32 oz - "Triggering ActionFor animals. For humans Designed to trigger the body’s own pain fighting chemical." QuickDraw™ now comes in a 32oz Soak size for full body relief! When used as a wrap or compress on humans or animals, QuickDraw™ can assist the body in facilitating ease by using its own pain fighting chemical manufacturing mechanism.